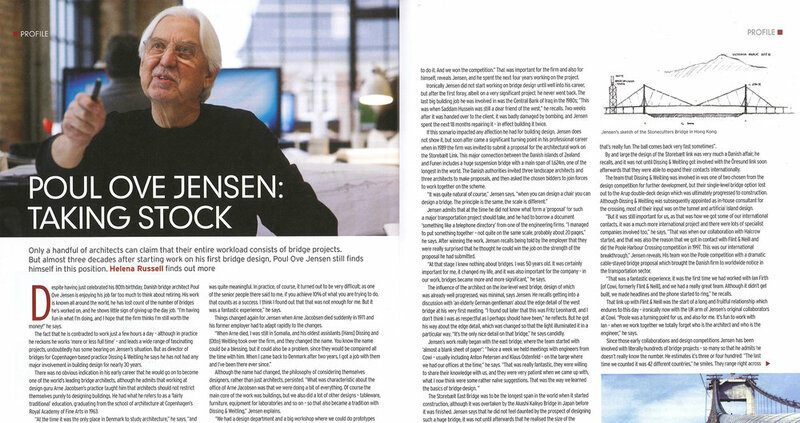 In honor of his many years of designing spectacular landmark bridges all across the globe, Bridge Design & Engineering brings an in-depth interview with Poul Ove Jensen, our renowned Director of Bridges. Bridge Design & Engineering is the leading international magazine focusing exclusively on the bridge industry. Poul Ove Jensen recently turned 80, and to celebrate his impressive accomplishments, designing signature bridges all around the world for more than 25 years, the magazine decided to bring an extensive interview. When DISSING+WEITLING won the contract for the architectural design of the Great Belt Link in Denmark in 1989, it was the beginning of a long and successful adventure, which has led us to designing bridges in all scales all over the world. Working at DISSING+WEITLING, Poul Ove Jensen has been involved in literally hundreds of bridge projects. Our portfolio includes all types of bridges, ranging from elegant small-scale pedestrian and bicycle bridges, to remarkable mechanic road bridges and iconic landmark spans. Poul Ove Jensen has been the lead designer on several famous and iconic bridge projects around the world, such as Stonecutters Bridge in Hong Kong, the newly opened Queensferry Crossing over the Firth of Forth in Scotland and the future Hising Bridge in Gothenburg, Sweden - just to mention a few. Each of our projects is a unique solution to a unique set of challenges in each project’s particular individual urban and cultural context. Our solutions are typically based on a deep analysis of these contextual issues in combination with our expertise regarding best practices. Based on the principles of the Scandinavian design tradition and its understated elegance, our bridge designs embodies a high degree of aesthetic integrity and visual refinement, always reflecting an optimal synthesis of structure and aesthetics. Bridges and infrastructure design is only one aspect of our portfolio, which also includes distinctive international business headquarters, sustainable hotels and conference centers, attractive housing and residential areas as well as restorations and transformations for renowned cultural institutions.